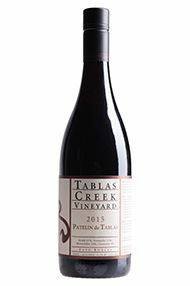 Tablas Creek is the realization of the combined efforts of two of the international wine community's leading families, the Perrin family, proprietors of Château de Beaucastel, and Robert Haas, founder of Vineyard Brands. They had since the 1970s believed the California climate to be ideal for planting Rhône varietal grapes. In 1987, they began the lengthy process of creating a Châteauneuf-du-Pape style vineyard from scratch in the New World. The partners searched California from the foothills of the Sierras in the north to coastal Ventura County in the south, looking for a close match to the Mediterranean climate and high pH soils of Château de Beaucastel. 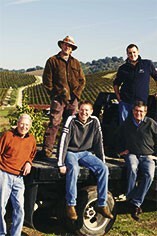 In 1989, they purchased a 120-acre parcel twelve miles from the Pacific Ocean in west Paso Robles. They named it Tablas Creek Vineyard, after the small creek running through the property. The property elevation averages 1,500 feet, and the shallow, rocky limestone soils are of the same geologic origin as those at Beaucastel. Summer days are hot and sunny, but the influence of the nearby Pacific cools the nights, and the remarkably Rhône-like Paso Robles climate allows the grapes to mature fully and yet retain crisp acidity. To ensure that the vines at Tablas Creek were of the highest quality and same genetic source of those at Beaucastel, the partners imported vinifera from the French estate. Several clones each of Mourvédre, Grenache Noir, Syrah, Counoise, Roussanne, Viognier, Marsanne, Grenache Blanc and Picpoul Blanc were imported. This diversity allows Tablas Creek to replicate the clonal selection of an established French vineyard. In January 1990, the first vine cuttings were imported from France. 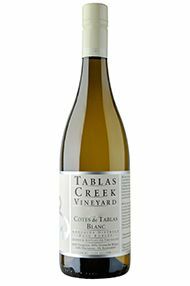 Before arriving at Tablas Creek, they underwent a USDA-mandated three year indexing process that ensured that the vines were virus-free; the first imported vines were available for multiplication at Tablas Creek in 1993. 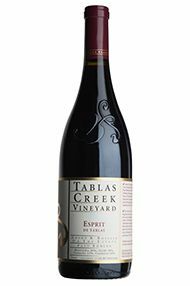 New clones arrived at Tablas Creek each year between 1993 and 2000. Planting continues at the estate, with the goal of having 110 acres in vines by 2010. The Tablas Creek Vineyard label debuted with the construction of the estate winery for the 1997 vintage. Beginning with the 2001 whites and the 2000 reds, the wines were named Esprit de Beaucastel and Esprit de Beaucastel Blanc.